In the high mountain passes of the Himalayas, it is common to see colorful prayer flags blowing in the wind. Traditionally, prayer flags are used to promote peace, compassion, wisdom and strength. The flags do not carry prayers to gods, a common misconception. Rather, the Tibetans believe the blessings will be blown by the wind to spread good will into all pervading space. 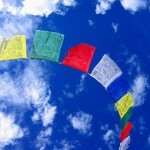 Therefore, prayer flags are thought to bring benefit to all. I also love this symbolism about the flags: The prayers of a flag become a permanent part of the universe as the images fade from exposure to the elements. Just as life moves on and is replaced by new life, Tibetans renew their hopes for the world by continually mounting new flags alongside the old. This act symbolizes a welcoming of life’s changes and an acknowledgment that all beings are part of a greater ongoing cycle. A perfect symbol for All Beings Everywhere! The prayer flags on my home page were shot by the talented photographer, Henry GL, in the Indian hill station of Mussoorie, Uttarakhand. I use them with his permission and am grateful that his flags connected us over the vast distances between the United States and the United Arab Emirates.